Our range of Poultry Products: Feed Supplements is specially made to provide nutritious content to the cattle and dairy farm animals. We manufacture all products at our GMP approved facility and stringently test our entire range before offering it on commercial basis. 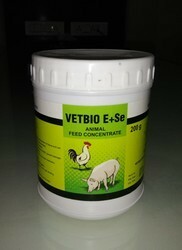 We are offering a range of Vetbio E Se. Prevent Early embryonic deaths, gizzard damage, reduced hatchability, exudative diathesis, muscular dystrophy, and encephalomyelitis. Dosage: 5 g in drinking water for 200 chicks/growers or layers and 5 g in drinking water for 50 broilers or 200 gram per ton of feed. 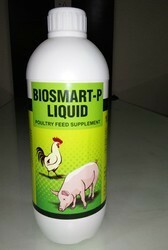 Dosage 4-5 ml / 100 chicks for 5-7 days, 5 ml / 100 Broilers or Layers for 5-7 days. The product is a Stress Reliever which contains Vit. A, Vit. E, Vit. D3 and Vit. C. The supplement is effective in expending immunity & corrects calcium. Each ml contains Vit. A - 50,000 I.U. Vit. E- 30 I.U. 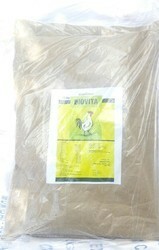 Dosage: 4-5 ml / 100 chicks for 5-7 days, 5 ml / 100 Broilers or Layers for 5-7 days. Composition : Containspotassium citrate, sodium citrate, natural immunostimulant, Vit. B, Vit. B2, Niacin, Vit. K3, Vit. C and Carrier. The product works actively in Gout and Arthris condition and helps in improving livability. Composition : Contains high nutritional of protein hydrolysate, amino acids as arginine, methionine, cystine, phenylalanine, glycine, serine, histidine, tyrosine, isoleucine, threonine, leucine, tryptophan, l-lysine, valine, l-lysine, chloride, cobalt, copper, iodine, iron, magnesium, manganese, potassium, sodium, zinc, papain, yeast extract, carbohydrates, permitted flavour , total nitrogen- 0. 184 g, total energy- 14.00 kcal. Indications : The supplement can be used in the condition of disease, stress and digestive disturbances and is available in different quantities. Packaging Details: Liquid: 1 Lit, 5 Lit or as per customer request. 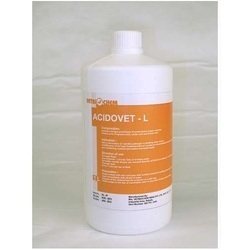 We offer a range of Buffered Organic Acids (Acidovet P). Composition : Constitutes of Buffered organic acids & salts like Calcium Propionate, Sodium Formate, Propionic acid, Formic acid, Fumaric acid and Citric acid with some other organic acids & acid salts. 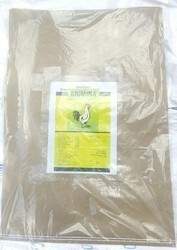 Indication : The product serves to reduce the bacterial count in the feed and many other. This products is available in different pack sizes. 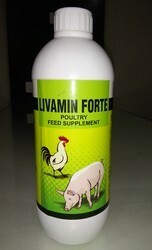 We are offering Livamin Forte Feed Supplement. The product contains choline chloride, liver extract, yeast extract, vitamin B, vitamin B12, niacin, D-panthenol, inositol, DL-methionine, L-lysine, manganese, zinc and aqueous base. 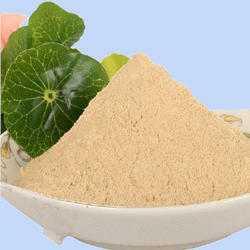 The product helps in keeping liver healthy and is a supplement in many toxic conditions. The product is available in different pack sizes. Packaging Details: 1 Lit, 5 Litres, 25 Litres or as per customer request. 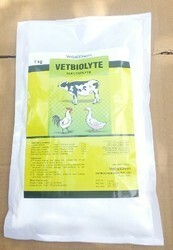 Dosage 1.0 to 1.5 Kgs/T of ready feed. 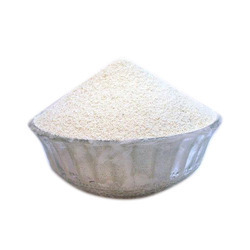 Vetsorb (Toxin Binder ) contains mannan oligosaccahrides, muravic acid, choline chloride, activated charcoal, copper oxine, sodium formate & aluminium silicates of sodium & calcium. Vetsorb inactivates mycotoxins in feed due to the content of 2 parts: mineral & organic, the binding to mycotoxins happens due to the principle of adsorption. The principle of adsorption is based on the action of level hydration, forming of the adsorbents. Due to the long connection of water – positive & negative charged at intervals – hydration cover pulls to itself the polar functional groups of mycotoxins. The binding together of mycotoxins begins in the oral cavity & continues in the gastero-intestinal tract of the animals & birds. Toxins, which are bound by toxisorb, are removed from the organism thru the excreta, after which they are decomposed into pit micro-organisms. Recommended rate of usage – 1.0 to 1.5 Kgs/T of ready feed. 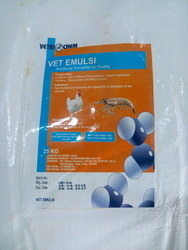 Packaging Details: Vetsorb is in a fine powder form with grayish-black colour & is not soluble in water. Storage Instructions Store in a cool dry place without exposure to direct sunlight. Temp. range from minus -5 to + 30 degrees C. & with a relative humidity of not more than 80 %. Composition : Phosphatydal choline, trimethyl polipeptide and methyl donars which increase the digestability of long chain saturated fatty acid. A blend of hydrolysed lecithin, lysophospholipids. Mixed In The Animal Feed Used As A Nutrition Supplier. It Enhances The Growth Rate And Improves The Food Conversion Efficiency. 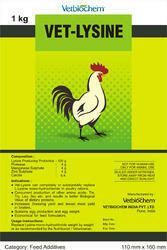 Herbal Veterinary Feed Additives contains many phytochemical activities of L - Lysine in vivo. Composition : Contains Sodium chloride, Calcium lactate, Magnesium sulphate, Calcium gluconate, Potassium chloride, Sodium Citrate, Sodium bicarbonate, Ascorbic acid, Dextrose monohydrate and Carriers. Provides energy and supportive therapy for chicks immediately after arrival at farm. For energy and supportive therapy during diseases like Nephritis, Nephrosis, Perosis, Salmonellosis, E. coli & Coccidiosis. To maintain correct osmotic pressure and precise acid-base equilibrium. Packaging Details: 250 gms, 500 gms 1 Kg or as per customer request. Dosage Recommended by the Nutritionist / Veterinarian. Vet Lysine is essential for a great variety of functions in the body namely; as a precursor for hormones, neurotransmitters, pigments and several molecules. It’s most important function, however, remains for biosynthesis of variety of proteins including metabolic enzymes and storage proteins. Vet Lysine consists of L-Lysine producing Microbe Corynebacterium glutamicum and other amino acid producing Probiotics in a fortified base with suitable nutrients that facilitate Lysine production. Replace Lysine-mono-hydrochloride weight by weight or as recommended by the Nutritionist / Veterinarian. We are offering a range of Enzymes for Animal Feed (Fermentol). The product, Fermentol W, WB, HF, CS granular, contains a mix of enzmes,Cellulase, Amylase, Xylanase, Pectinase, Glucoamylase and Beta-Glucanase. 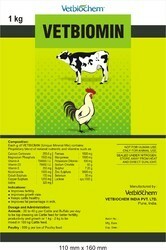 The product assures compensatory growth and improves feed utilisation. Packaging Details: Polypack of 5kg. 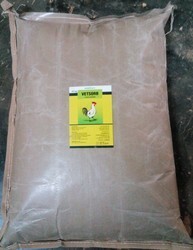 Pack of 25kgs or as per customer request. Fermentol F Supplements , is a mix of Phytase, Fermentol F liberates & Phosphorus. The product assures better feed quality & biosecurity. Fermentol (multi) is a unique blend of enzymes like amylase, cellulase, protease, phytase, pectinase, xylanase, lipase,mannanase, galactosidase and beta glucanase suitable for a array of feed stocks. Cereals such as wheat etc. Contain long, complex carbohydrate also known as non-starch polysaccharides (nsps), for which animals like pigs and poultry do not produce the necessary digestive enzymes to hydrolyse. Nsps in cereals like wheat, are called arabinoxylans, and those in barley are beta-glucans, such are recognized as anti-nutritional in behaviour. They increase the viscosity of food and puts a pressure on the animal’s own enzymes (digestive system). It has negative impact on the nutritional absorption values in the absence of suitable enzymes. Addition of aforesaid enzymes also known as nsp enzymes to animal diets allows the breakdown of these anti-nutritional factors and thus faster and more complete digestion of the feed, leading to improved nutritive value. 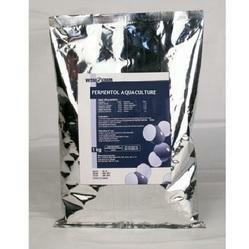 We are offering a range of Fermentol Aquaculture. Product contains: Phospotidylcholine, Phosphotidylinositol and Coenzymes. Survival of Larvae and juveniles growth. Leaching of water soluble nutrients. Lysozymes are enzymes of ubiquitous nature, occurring widespread in humans, animals, birds, invertebrates as well as bacteria, phages and plants. . They are found in various body fluids, external body secretions like tears, saliva, gastric juices, tracheal secretion and small amounts in internal secretions like serum, pleural fluid and CSF (Cerebrospinal fluid). Granulated lysozyme 100 mg/kg of diet compared with neomycin and oxytetracycline (16 mg/kg of diet) showed a better growth performance, small intestinal morphology, and Campylobacter shedding in 10-day-old pigs. Calves (14-70 daysof life) fed with 36 mg/head/day of lysozyme isolated from hen's egg white, 16 mg/head/day of flavomycin. The highest daily weight gains & leukocyte count were noted for lysozyme treatment, then for flavomycin and the lowest for control. Multivitamin feed supplement with essential amino acids for optimal growth and development of birds. · Provides energy & supportive therapy for chicks immediately after arrival at farm. 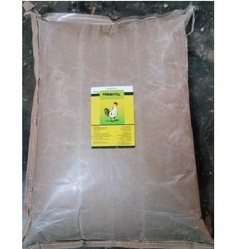 · Poultry: 1 to 2g per ton of Poultry feed for 15-20 days. Looking for Poultry Care ?